Baton Rouge, LA – December 16, 2014 – Lamar Advertising Company (Nasdaq: LAMR), one of the nation’s largest out-of-home media companies, is pleased to announce a new partnership with leading global OOH communications agency Posterscope for the beta launch phase of the world’s first real-time trading platform for digital billboards. The platform is the result of a partnership between Posterscope, leading location-based technology company Vistar Media and Lamar Advertising Company. Posterscope and Vistar Media selected Lamar Advertising Company as a media owner partner for the beta launch phase, which commences during the first quarter of 2015. Lamar Advertising owns and operates more than 2,000 digital billboards across the U.S. and Puerto Rico. Posterscope will utilize Vistar’s digital OOH real-time buying platform to offer brands greater agility and audience targeting, as well as access to premium inventory, while growing the OOH market by opening up more online budgets to the medium. The move helps ensure that Posterscope’s clients can take full advantage of the connectivity of digital OOH. The initiative creates a premium quality ‘private marketplace’ combining audience-based trading with location-based intelligence. This also sets the groundwork for brand-new applications of increasingly real-time data to inform OOH buying decisions. In a related initiative, Posterscope and Vistar have worked together on the application of location-based mobile data to optimize both traditional and digital OOH planning and buying, utilizing a variety of sources including Airsage, which aggregates location data from two of the largest US mobile carriers. This complements Posterscope’s groundbreaking partnership with the UK’s largest carrier, EE, which has driven increases in brand metrics delivered by OOH campaigns by up to 200%. Vistar’s location data analytics will be integrated with Posterscope’s own proprietary planning tools, data platform, and operating system in 2015 to allow the seamless application of multiple datasets whether first, second or third party. 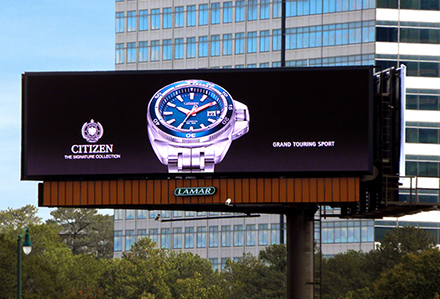 Lamar Advertising Company is the nation’s leading outdoor advertising firm. Lamar offers solutions for clients in the form of bulletins, posters, digital billboards, buses, benches, transit shelters and highway logo signs. Founded in 1902, Baton Rouge-based Lamar has a broad corporate reach with over 200 locations across the United States, Canada and Puerto Rico specializing in outdoor and transit advertising. In addition, Lamar has 22 locations devoted to the highway logo sign business. This network provides clients with local market insight, as well as the services provided by a firm on a national scale. We have a lot to offer, but it all serves one purpose: helping our clients stand out. Please feel free to explore our website www.lamar.com for additional information. Posterscope is the world's leading Out‐Of‐Home communications agency and knows how consumers behave when Out‐Of‐Home more comprehensively than anyone else. Posterscope understands how Out‐Of‐Home advertising integrates with other media, including mobile and digital, and pioneers trials to understand how consumers do and will use emerging and evolving technologies both now and in the future. With billings in excess of $2.2 billion, we have over 700 people in 48 offices located in 27 countries worldwide. Posterscope group agencies include international agency PSI and brand experience agency psLIVE. Vistar Media utilizes patent-pending geospatial audience technology to better understand consumers' real-world movements and behaviors from location data. As the only ad platform powered by mobile carrier data from two of the country's largest wireless providers, Vistar Media enables advertisers to more accurately and completely reach on-the-go consumers, whether they are looking down at their phones or around at their surroundings. By leveraging these location-based insights via a first-of-its-kind, cross-screen advertising platform, Vistar Media helps target audiences and reach consumers with a unique mobile and out-of-home execution. This holiday season, Lamar Advertising Company is encouraging people all over the world to express gratitude on digital billboards in North America. 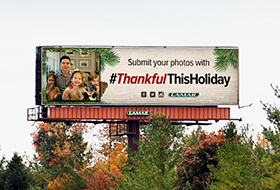 The #ThankfulThisHoliday campaign utilizes Lamar’s flexible digital capabilities to feature authentic, user-generated content from social media and display it on its digital out-of-home network.